Like many buildings and houses in the District of Columbia, the well known building on the northeast corner of 18th and S Street was not built as the result of one particular building permit, but rather evolved over time from a modest house with a series of additions and alterations. It served for many years as the original location of the famed Lauriol Plaza, a Mexican restaurant now located a block north, in a new building at 18th and T Street. Today, its the location of Rosemary's Thyme restaurant at 1801 18th Street. Interestingly, the original configuration of the corner building was that of a brick townhouse, matching those located between 1743 and 1753 S Street today. They were all built simultaneously sometime before 1874, the year they were valued at $3,000 each, a substantial sum for the time. They are situated well behind the building line, providing a deep front yard. The end two houses, 1759-1761 S Street, at 18th Street, were later added onto both the front and rear to form a grocery story, and later a restaurant; they also later had a duel address of 1801-1805 18th Street when their orientation was changed to face west. An adjoining building at 1807 18th Street was built by Susan Fletcher in1889, the same year three rear wood frame kitchens were added to the corner buildings. Susan Fletcher was the owner of record of the corner building in September of 1900, when Wilhelm Schmidt applied for a permit to construct three large show windows on the corner, one measuring over 22 feet long, all at a cost of $600. A grocer, Schmidt would operate a business at the location for about 30 years, which also carried the finest array of wines and liquors, delivered by a horse drawn truck, seen in the image above. 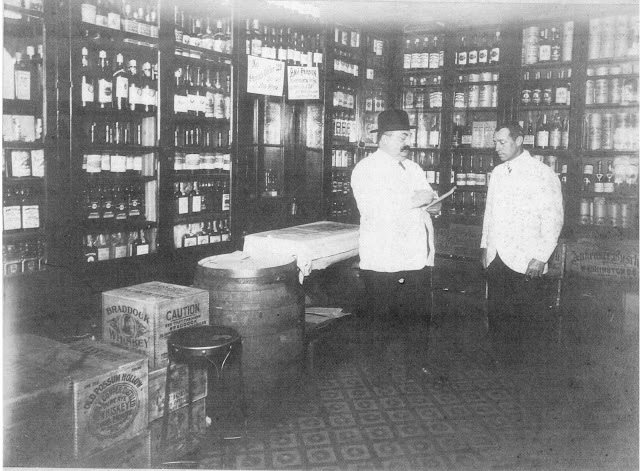 Wilhelm Schmidt is pictured above about 1908 inside his business in the liquor room. Signs on the wall indicate that no one under the age of 21 was allowed in the room, and on the floor one can see stacks of “Old Possum Hollow” whiskey. 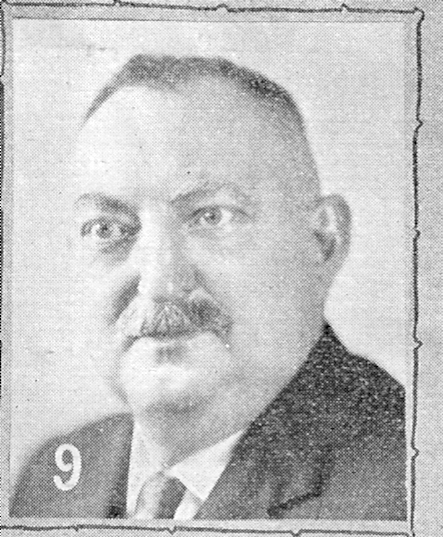 Schmidt ran a successful business at the site for nearly three decades, and when he died in 1935, he left an estate worth and estimated $400,000, an impressive sum not long after the Depression was coming to a close. Always conscience community members, the Schmidt’s set up a food stand for the rescue workers aiding the victims of the Knickerbocker Theatre disaster in January of 1922. 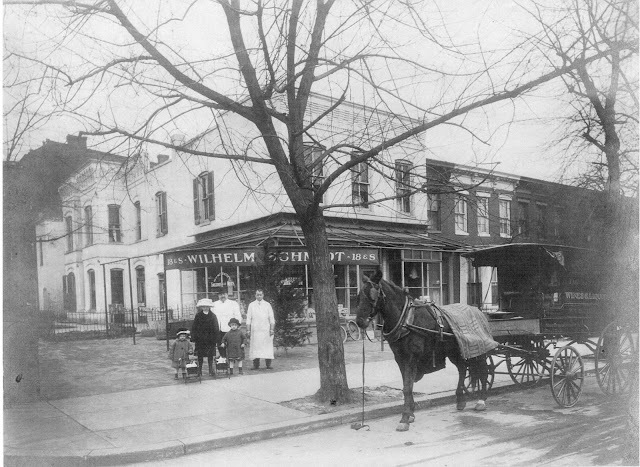 The 1920 census taken at the corner store indicated that Wilhelm Schmidt lived above his business, typical at the time. He resided there along with his wife Johanna, and five daughters ranging in age from 4 to 22. Wilhelm had been born in 1872 in Germany, and had immigrated to the U.S. in 1888, according to the census taker. His wife Joanna had been born in Germany in 1875, and emigrated in 1893. They both became U.S. citizens in 1896. By 1930, the City Directory indicates that Wilhelm and Joanna had moved into a house at 4225 17th Street in the Crestwood neighborhood. A Note on Source: InTowner newspaper reader Chris Hinkle contacted the author and provided the rare and personal vintage photographs of his ancestors, longtime Washingtonians, accompanying this feature. We are grateful that his sharing of family history can benefit and educate a new generation of residents.